Analyst firm EMA has found that artificial intelligence and machine learning are the biggest investment priorities for DevOps and IT operations teams in 2018. Although AI/ML buzz is currently at the peak of the technology hype cycle, EMA has found that enterprise IT teams are realizing huge efficiencies by unifying operational silos for dynamic IT services and extracting signal from noise across endless alert floods. Uptime Institute (2018) finds that nearly a third of IT outages cost more than $250,000 while 15% of reported outages set enterprises back by more than $1 million! Given the increased adoption of cloud-native architectures, the only way to maintain digital services is to marry human expertise with algorithmic intelligence. 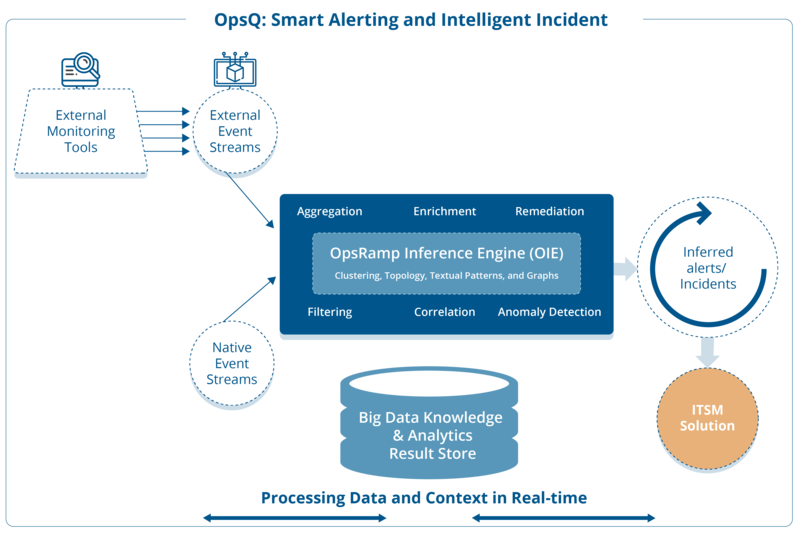 OpsRamp’s newly launched service-centric AIOps solution applies data science and related computational techniques to dramatically reduce the human time spent per alert. Figure 1 - IT outages can result in lost revenues, lost productivity and lost reputation. The core of OpsRamp's service-centric AIOps solution is the OpsQ event management engine. OpsQ drives down the human time spent on first response, alert prioritization and root cause(s) analysis with rapid event ingestion, accurate alert inferences, faster ticket assignments and quicker incident remediation. OpsQ drives higher productivity by helping enterprises manage a much larger volume of IT events without investing in additional staff or context switching between different tools. Figure 2 - Prevent digital disruptions and remediate issues quickly with service-centric AIOps. Topology-based Event Correlation. Correlate the context of hybrid infrastructure resources and IT service dependencies so that you can shift from resource-level monitoring to service-level management. OpsRamp’s service maps and topology explorer help you isolate and fix issues for critical IT services through clear visualizations of application and infrastructure dependencies. Clustering-based Event Correlation. Identify and correlate alerts that share similar alert properties or event attributes such as subject, alert metric, alert source, host name, IP address and device type. OpsQ helps you cut down on large volumes of false alerts and quickly take action with the right alert prioritization. Co-Occurrence-based Event Correlation. 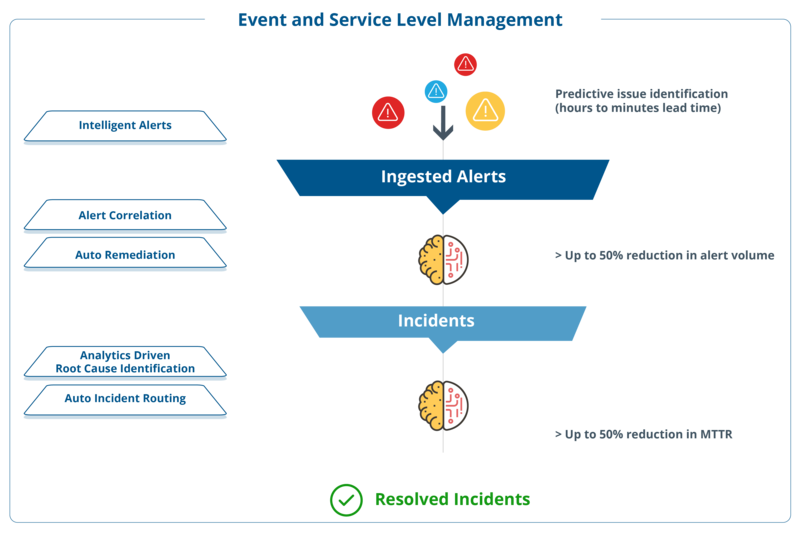 Co-occurrence helps you group alerts based on the historical patterns of specific alert sequences. OpsQ applies machine learning algorithms to learn existing alert sequences, discover hidden connections and reduce alert fatigue with pattern recognition and detection. Data Lake. The data lake holds vast amounts of raw event data in its native format. OpsRamp then applies both batch and streaming techniques on raw data for enhanced event compression and real-time analytics. Data Warehouse. The data warehouse runs jobs for data analytics and machine learning to extract unique insights from raw operational data. Data Hub. The data hub supports governance and master data models to enable effective data sharing through OpsRamp's dashboards, reports and other tools. Figure 3 - Recognize redundant alerts, suppress noise and route incidents faster with OpsRamp's big data platform. Download our Top Trends In AIOps Adoption report. Check out the OpsRamp OpsQ datasheet. Schedule a custom demonstration with a solution consultant today.